Oh God lol I'm 6 & a half weeks and I'm a little Bigger than that , tomorrow I have an ultrasound and now I'm really nervous everyone think I'm having twins but I honestly don't know. I know how you feel, I'm also between 4 and 5 weeks, and I'm huge. I've already had 3 kids, and only started showing at round-about 5 months, never this early. My lower back is also bothering me, sometimes more than other times. And my lower stomach sometimes hurts when I get up too fast. We think its twins, but I'm going to make sure with a scan the end of the month, I think that's the best way too find out. Good luck to all the moms that suspect they're having twins, I know for sure I'm very nervous to find out, lol. Now I dont feel bad. I am also 5 weeks and I am just as big. I just cant stop eating though and I am exhausted all the time. Everything I do I am exhausted. Congrats once again. I am going for my Ultra sound in 2 weeks. 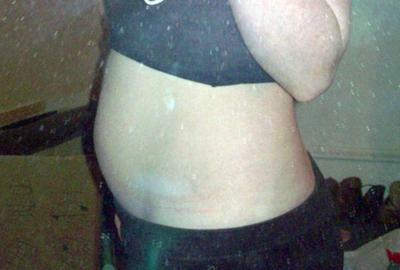 wow you are already showing...... congrats... cute belly. in 5 days i'll get a blood test to find out if i'm prego.. but i already did 2 home tests and came positive... scared to break the news yet.. not until the doc says yes you are prego..
best of luck for you. Is this your first or second pregnancy? I'm at 5 weeks pregnant and not sure if I'm having twins...my doctor doesn't want to do an ultrasound until I'm further along...ugh! Return to Twin Belly Photos - 0 to 12 Weeks.